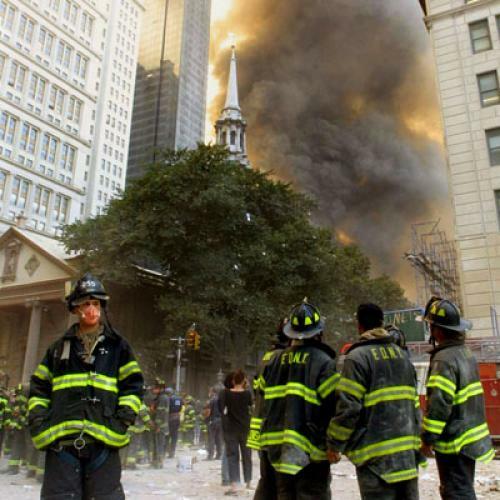 “September 11,” the voice on the tape said, startling me with an unexpected association. “Evidence of impending invasion has been accumulating all day. More ships moving west down the Channel.” I was visiting Churchill’s war rooms, the basement in Whitehall that served as his command center. The voice on the tape was reading from the diaries of General Alan Brooke, later chief of the Imperial General Staff but in the terrifying days of 1940 commander of the Home Forces, tasked with preparing England, lonely and excruciatingly vulnerable, against a German landing. (“The responsibility of feeling what any mistakes or even misappreciations may mean in the future of these isles and of the Empire is a colossal one.”) I brought my son with me to the subterranean shrine because I am teaching him to revere Churchill—“the largest human being of our time,” as Isaiah Berlin wrote in 1949. If children must have heroes, then they must have the proper ones. I am not teaching my boy to admire war, but I am also not readying him for a world too pretty. I do not want him to struggle, but there are struggles of which I want him to be proud. The aim, as with adults, is enchantment without delusion. I am not unaware of how fatuous Churchill worship can be. And I agree that September 11, 1940, is not the most lucid lens through which to ponder September 11, 2001, or the decade that followed it. The analogy is inaccurate, and sentimental, and inflating. We face a threat to our security, but we do not face a threat to our existence. There is no danger that our society will be converted to Mohamed Atta’s system of beliefs, though countries that matter significantly to us are—Arab tyrannies are overthrown, but Arab democracies are not yet established—in this way threatened. And yet the view that challenges of the old magnitude are behind us, and so we no longer have any use for the Churchillian qualities, is nonsense. Chemical, biological, and nuclear materials may yet find their way into the hands of maniacs who will use them; and without our relentless support of the forces of democracy around the world, some of these maniacs may fulfill their fantasies of power. We still have need of high purpose and hard will, and of an understanding of our significance. Liberty, at least for some people, is not yet a cliché. The United States is not yet Brazil. LINGERING IN THE great man’s bunker on King Charles Street, I was struck by the anachronistic character of the experience. This was “heritage,” and not only for its British visitors. In America, we are regularly inundated by contented affirmations of a new smallness. Now we are to dream of the mean. Heroism, we are told, is superfluous and even mendacious. Individual acts of bravery are just the mawkish stuff of Anderson Cooper. The aspiration to greatness is just the machojingo posturing of George W. Bush, who certainly gave largeness a bad name. Grandeur is confused with grandiosity. In our culture, it is said that we are too late for grandeur; in our politics, that we are too broke for it. In foreign policy, our objective has been an adjustment of scale—large ends with lesser means, or lesser ends. Nobody counsels courage anymore, except perhaps as an evolutionary adaptation. Our professors of philosophy (is there a more unagonized lot?) instruct us, and on the home page of The New York Times, that we have outlived the categories of good and evil, and announce the obsolescence of our foundations. Our legal scholars, and some of our judges, proclaim “minimalism.” Our economists preach that the most definitive study of human nature is the study of consumer behavior. Our gadgets leave us thinking technologically about almost everything. The general recommendation of the American weather, in sum, is that we should settle for being a nation of trend-sharers and problem-solvers, of aggregators and tinkerers. (The American right disagrees, and is acting, alas, on the potency of big beliefs.) So this is what happened to us after September 11: we swelled and then we shrank. Now we are in the era of the fight for our proportions. BUT THERE IS MORE that needs to be said. Shopping is not the highest expression of the will to live. We are fighting wars abroad that show almost no traces at home, except among the limited segment of the population whose children are fighting them, and we have been differently encouraged in this disconnection by George W. Bush and Barack Obama. When the financial cataclysm occurred, and the hardship in America became unconscionably widespread, we redirected our gaze almost entirely upon ourselves. First materialism, and then a crisis of materialism, turned us inward. After we were attacked, we were wearied. I worry that the insularity of America, which is its natural condition, and also its lasting temptation, is gathering a renewed prestige among Americans. Our insularity is a kind of safety and a kind of blindness. The attacks of September 11 punctured that safety and that blindness: we gained—at what cost!—a broader sense of historical possibility and a broader sense of historical agency. But we are listing. We want the safety back, of course, but I fear that we want the blindness back, too. Leon Wieseltier is the literary editor of The New Republic. This article originally ran in the September 15, 2011, issue of the magazine.